The delightfully visual Unplugged Woodshop comes from a seasoned custom furniture maker, hand tool expert and founder of The Unplugged Woodshop. 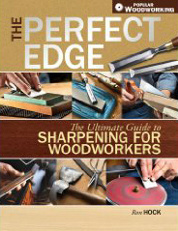 It’s a perfect resource for the growing number of hand tool woodworkers, and includes projects based on the reinvention of older designs, including a classic library card catalog converted to use as kitchen storage, a medicine chest that does double duty as a four-bottle wine tote, and an old-fashioned gentleman’s valet that becomes an elegant clothing stand. Along with such old-time, quirky projects, Fidgen provides practical instruction, useful pointers and savvy advice for working with and sharpening hand tools, how to approach glues and finishes, and how to make your own hand tools using only hand tools.